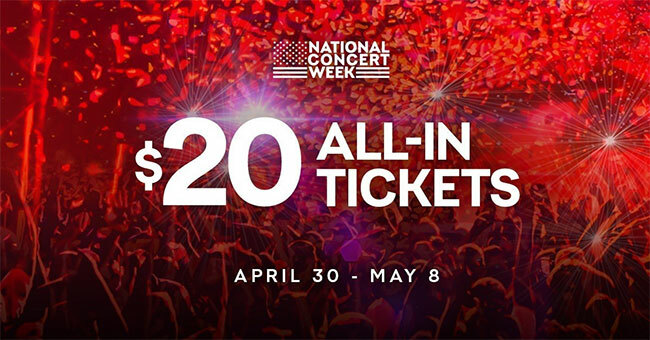 Live Nation has announced National Concert Week will take place April 30th through May 8th with an exclusive $20 all-in ticket offer for fans to celebrate the kickoff to its biggest summer season. The deal will include over 1.5 million tickets to 2,000+ shows across Live Nation’s roster of summer tours including comedy, country, hip-hop, Latin, metal, rock, pop, and more. For one week only, fans can get their hands on the $20 all-in tickets Monday, April 30th at 8 am local time at NCW.LiveNation.com, through Tuesday, May 8th at 11:59 pm local time. DJ Khaled shared his excitement about the ticket offer from 45,000 feet, encouraging music fans to nab their tickets to the hottest summer shows. Watch below. Talent in attendance talking about their upcoming summer tours will include Bon Jovi, Shania Twain, Paramore, Lindsey Stirling, Bush’s Gavin Rossdale, Jeff Beck, Counting Crows’ Adam Duritz, Ann Wilson of Heart, Evanescence’s Amy Lee, Foreigner’s Mick Jones, 3 Doors Down, Bad Company and Free’s Paul Rodgers, Coheed and Cambria, Collective Soul, Pentatonix, O.A.R., Poison, Soul Asylum, Stone Temple Pilots, Styx, Taking Back Sunday, The Cult, The Offspring, Whitesnake, and more.